Reduction of Carbon Footprint is necessary to save environment: | PARTHA DAS SHARMA's Weblog on "Keeping World Environment Safer and Greener"
Environment protection, Global warming and climate change are most priority of everybody – nations’, companies’ and individuals’. Reducing carbon foot prints is the topmost concern. A. Carbon footprint is a ‘measure of the impact of human activities leave on the environment in terms of the amount of green house gases produced, measured in units of carbon dioxide’. It is meant to be useful for individuals and organizations to conceptualize their personal or organizational impact in contributing to global warming. Reduce your carbon footprint. Whether in coal, oil or gas, carbon is the essential ingredient of all fossil fuels. When these fuels are burned to provide energy, carbon dioxide (CO2), a “greenhouse gas”, is released to the Earth’s atmosphere. a. What exactly is our current relationship with carbon? b. How can we reduce our dependency on carbon emitting technologies and fuels – our carbon footprint? c. What steps are others taking around the world? B. As carbon footprint is the measure of carbon dioxide during the life of a particular industry, ‘life cycle’ concept of carbon footprint is familiar. The life cycle concept of the carbon footprint means that it is all-encompassing and includes all possible causes that give rise to carbon emissions. In other words, all direct (on-site, internal) and indirect emissions (off-site, external, embodied, upstream, downstream etc.) need to be taken into account. (e) The last important step includes carbon offsetting; investment in projects that aim at the reducing CO2 emissions, for instance bio-fuels or tree planting activities. C. Calculating carbon footprints – Carbon footprints are calculated using a method called life cycle assessment (LCA). This method is used to analyze the cumulative environmental impacts of a process or product through all the stages of its life. It takes into account energy inputs and emission outputs throughout the whole production chain from exploration and extraction of raw materials to processing, transport and final use. The LCA method is internationally accredited by ISO 14000 standards. a. Fossil fuelled technologies – The carbon footprint of fossil fuelled power plants is dominated by emissions during their operation. Indirect emissions during other life cycle phases such as raw material extraction and plant construction are relatively minor. ii) Oil accounts for only a very small proportion (about 1%) of the electricity generated in most of the countries. It is primarily used as a back-up fuel to cover peak electricity demand periods. The average carbon footprint of oil-fired electricity generation plants is ~650gCO2eq/kWh. iii) Current gas powered electricity generation has a carbon footprint around half that of coal (~500gCO2eq/kWh), because gas has a lower carbon content than coal. Like coal fired plants, gas plants could co-fire biomass to reduce carbon emissions in the future. b. Low carbon technologies – In contrast to fossil fuelled power generation, the common feature of renewable and nuclear energy systems is that emissions of greenhouse gases and other atmospheric pollutants are ‘indirect’, that is, they arise from stages of the life cycle other than power generation. i) Biomass – Biomass is obtained from organic matter, either directly from dedicated energy crops like short-rotation coppice willow and grasses such as straw, or indirectly from industrial and agricultural by-products such as wood-chips. The use of biomass is generally classed as ‘carbon neutral’ because the CO2 released by burning is equivalent to the CO2 absorbed by the plants during their growth. However, other life cycle energy inputs affect this ‘carbon neutral’ balance, for example emissions arise from fertilizer production, harvesting, drying and transportation. ii) Photovoltaic (PV) – Photovoltaic (PV), also known as solar cells, are made of crystalline silicon, a semi-conducting material which converts sunlight into electricity. The silicon required for PV modules is extracted from quartz sand at high temperatures. This is the most energy intensive phase of PV module production, accounting for 60% of the total energy requirement. Life cycle CO2 emissions for photovoltaic power systems are currently 58gCO2eq/kWh. However, future reductions in the carbon footprint of PV cells are expected to be achieved in thin film technologies which use thinner layers of silicon, and with the development new semi-conducting materials which are less energy intensive. iii) Marine technologies (wave and tidal) – There are two types of marine energy devices; wave energy converters and tidal (stream and barrage) devices. Marine based electricity generation is still an emerging technology and is not yet operating on a commercial scale. iv) Hydro – Hydropower converts the energy from flowing water, via turbines and generators, into electricity. There are two main types of hydroelectric schemes; storage and run-of -river. Storage schemes require dams. In run-of-river schemes, turbines are placed in the natural flow of a river. Once in operation, hydro schemes emit very little CO2, although some methane emissions do arise due to decomposition of flooded vegetation. Storage schemes have a higher footprint, (~10-30gCO2eq/kWh), than run-of-river schemes as they require large amounts of raw materials (steel and concrete) to construct the dam. v) Wind – Electricity generated from wind energy has one of the lowest carbon footprints. As with other low carbon technologies, nearly all the emissions occur during the manufacturing and construction phases, arising from the production of steel for the tower, concrete for the foundations and epoxy/fibreglass for the rotor blades. Emissions generated during operation of wind turbines arise from routine maintenance inspection trips. This includes use of lubricants and transport. Onshore wind turbines are accessed by vehicle, while offshore turbines are maintained using boats and helicopters. The manufacturing process for both onshore and offshore wind plant is very similar, so life cycle assessment shows that there is little difference between the carbon footprints of onshore (4.64gCO2eq/kWh) versus offshore (5.25gCO2eq/kWh) wind generation. vi) Nuclear – Nuclear power generation has a relatively small carbon footprints (~5gCO2eq/kWh). Since there is no combustion, (heat is generated by fission of uranium or plutonium), operational CO2 emissions account for <1%. During December 1997, more than 160 nations met in Kyoto, Japan, to negotiate binding limitations on greenhouse gases for the developed nations, pursuant to the objectives of the Framework Convention on Climate Change of 1992. The outcome of the meeting was the ‘Kyoto Protocol’, in which the developed nations agreed to limit their greenhouse gas (GHG) emissions, relative to the levels emitted in 1990. The goal is to lower overall emissions from six greenhouse gases (GHGs) – carbon dioxide, methane, nitrous oxide, sulfur hexafluoride, HFCs, and PFCs – calculated as an average over the five-year period of 2008-12. The objective is to achieve “stabilization of greenhouse gas concentrations in the atmosphere at a level that would prevent dangerous anthropogenic interference with the climate system. As of November 2007, 175 parties have ratified the protocol. (c) the share of global emissions originating in developing countries will grow to meet their social and development needs. In other words, China, India, and other developing countries were not included in any numerical limitation of the Kyoto Protocol because they were not the main contributors to the greenhouse gas emissions during the pre-treaty industrialization period. However, even without the commitment to reduce according to the Kyoto target, developing countries do share the common responsibility that all countries have in reducing emissions. 2. The developed countries commit themselves to reducing their collective emissions of six key greenhouse gases by at least 5%. As per the convention, this group target will be achieved through cuts of 8% by Switzerland, most Central and East European states, and the European Union (the EU will meet its target by distributing different rates among its member states); 7% by the US; and 6% by Canada, Hungary, Japan, and Poland. Russia, New Zealand, and Ukraine are to stabilize their emissions, while Norway may increase emissions by up to 1%, Australia by up to 8%, and Iceland 10%. Each country’s emissions target must be achieved by the period 2008-2012. Cuts in the three most important gases – carbon dioxide (CO2), methane (CH4), and nitrous oxide (N20) – will be measured against a base year of 1990. Cuts in three long-lived industrial gases – hydrofluorocarbons (HFCs), perfluorocarbons (PFCs), and sulphur hexafluoride (SF6) – can be measured against either a 1990 or 1995 baseline. 3. Experts opine, actual emission reductions would be much larger than 5%. The richest industrialized countries (OECD members) would need to reduce their collective output by about 10%, as there was backlog. While the countries with economies in transition have experienced falling emissions since 1990, this trend is now reversing. Therefore, for the developed countries as a whole, the 5% Protocol target represents an actual cut of around 20% when compared with the emissions levels that are projected for 2010 if no emissions-control measures are adopted. Some are skeptical about the scheme. They think Kyoto as a scheme to either slow the growth of the world’s industrial democracies or to transfer wealth to the third world nations. Others argue the protocol does not go far enough to curb greenhouse emissions. Many see the costs of the Kyoto Protocol as outweighing the benefits. Despite few oppositions majority of the countries support Kyoto protocol for reduction of greenhouse gases (GHGs) and already started working in the direction of reducing the emission of greenhouse gases. As discussed above, the Kyoto Protocol has created a mechanism under which countries that have been emitting more carbon and other gases of GHGs have voluntarily decided that they will bring down the level of carbon they are emitting to the levels of early 1990s; thus carbon credits are generated by enterprises in the developing world that shift to cleaner technologies and thereby save on energy consumption, consequently reducing their GHGs. A company has two ways to reduce emissions. One, it can reduce the GHG (greenhouse gases) by adopting new technology or improving upon the existing technology by attaining to the newer emission norms. Alternatively, the company may tie up with developing nations and help them set up new technology that is eco-friendly, thereby helping developing country or its companies ‘earn’ Credits. India, China and some other countries have the advantage because they are developing countries. Any company, factories or farm owner in India can get linked to United Nations Framework Convention on Climate Change (UNFCCC) and know the ‘standard’ level of carbon emission allowed for its outfit or activity. The extent to which they are emitting less carbon (as per standard fixed by UNFCCC) they get credited in a developing country. This is called ‘carbon credit’. These credits are bought over by the companies of developed countries – mostly EU countries. Our effort to control CO2 and other greenhouse gases (GHG) faces threatened due to present ongoing global recession. It is well known that, under the Kyoto Protocol industrilised nations agreed for reduction of CO2 and other GHGs in order to mitigate global warming and climate change. Subsequently, many nations introduced Carbon Trading System, whereby Authorities put a price on the amount of GHGs that can be emitted by any company. It was hoped that, by asking companies to pay for their GHGs emission, they would be inclined to make cleanup action. 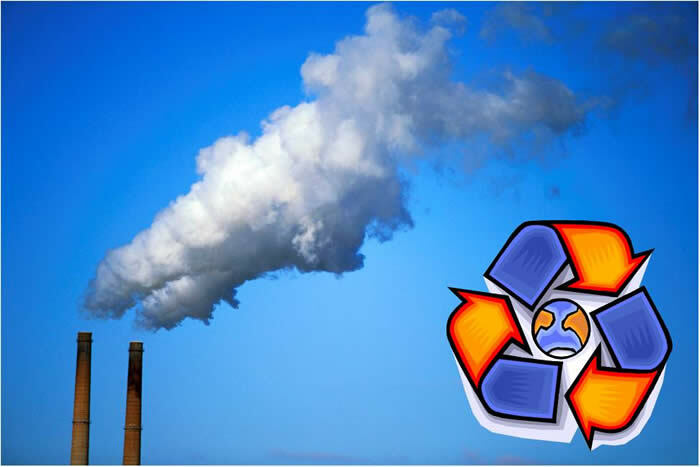 Thus, concept of issuing “Carbon Trading Permits” to various companies has started. Companies are issued emission permits as per the quota fixed for a particular industry. Companies that need to increase their emission allowance should buy credits from those who have surpluses. Effectively, the buyer is paying for polluting, while the seller is being rewarded for their reduction in emissions by more than what is needed. Now, due to ongoing recession the demand of most commodities have fallen sharply, thus the production and pollution from most of the polluted industries such as cement, steel and glass have been less. So, companies try to bolster their faltering balance sheets by selling of their gained Carbon Trading Permits. Strangely, that has led to, not only a big drop in the market value of Carbon Permits, the “Right to Pollute” has become cheaper as well. In other words, “Because of our faulty system”, now “There is less incentive available for companies to work towards mitigation of GHG emissions and climate change”. One Biosphere makes laws work for humans, habitats and the globe. With our non-partisan, independent approach, One Biosphere promotes sustainable solutions to difficult environmental problems. One Biosphere encourages and sponsors innovative research, sensible analysis and original publications to inspire, inform and empower citizens, policy-makers, business leaders, and environmental advocates globally. One Biosphere is committed to its role of environmental leadership in all facets of environmental protection. Reduction of Carbon footprints can lessen the green house gasses stocked in the atmosphere. If we will stop the different sources, little by little, we can help in decreasing the green house gasses that usually the cause of the global warming. If we are concern in the environment, lets reduce so that Mother Earth will be save! it is really to save the earth.